Hey, look at that; I’m up and running again. That’s right. Up and running. I have conquered the deep, dark, World-of-Warcraft-desiring darkness, recovered my files, and upgraded my computer. Like a champ. Forgive the big pat on my own back; it’s just that I’m pretty stoked that this all worked out. Partly because I seriously needed my old files and I’m praising baby unicorns they’re back and partly because I recovered my old hard drive by myself, with no help from the Geek Squad. And I’m pretty jazzed about that. It was just about the time that I began to publicly mourn the loss of my large-screen computer on Facebook via my tiny-screened phone that my brother, a Software Engineer, called me to diagnose the problem. He assured me that not only could my hard drive be retrieved, but that I could retrieve it. He told me it would make a great Lollipop Tuesday. If you’re one of the new subscribers in these parts (hello dumplings! 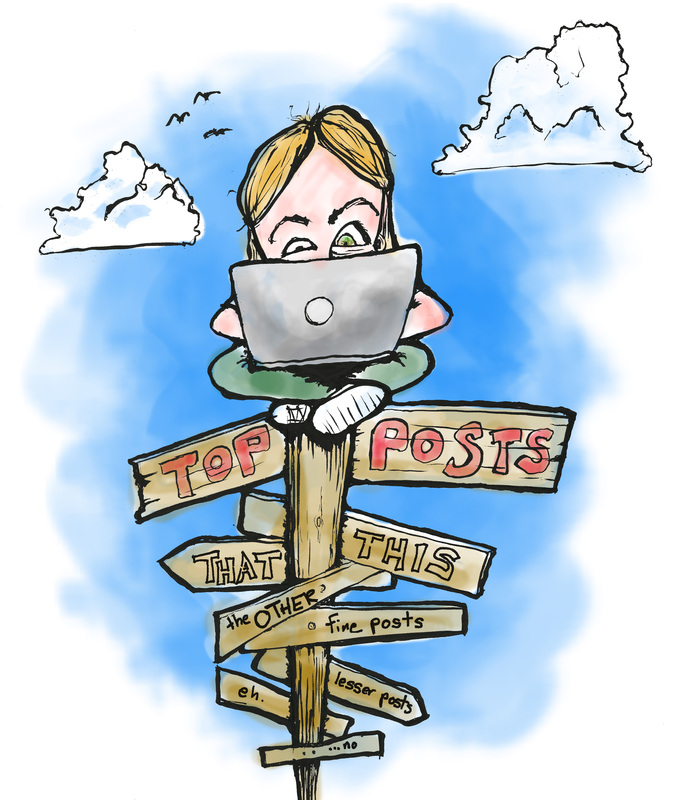 ), you can direct yourself to the “What’s Lollipop Tuesday?” tab at the top of the bloggy-blog. If you’re one of my not-so-new subscribers, why didn’t you tell me it had been ages since my last Lollipop Tuesday?! I haven’t tried anything new and scary in my life for months. MONTHS! Do you realize what’s happened to me? I’m frightened. I’m not going outside as often. I’m starting to lose faith in my ability to do the crazy. So let’s make a pact: I will begin to do Lollipop Tuesdays more regularlary and if I don’t, you will harass me. It’s a free harass pass. Enjoy. So from here on, I will catalogue my recovery of my hard drive for anyone who cares, doesn’t believe I did it, or happens to have a Dell Inspiron N5030. Because they tend to hit the crapper after a year and a half and if you own one and it hasn’t crapped out yet, FOR THE LOVE OF BABY UNICORNS, BACK UP YOUR FILES. Okay. Everyone who doesn’t want to be bored: see you next week. 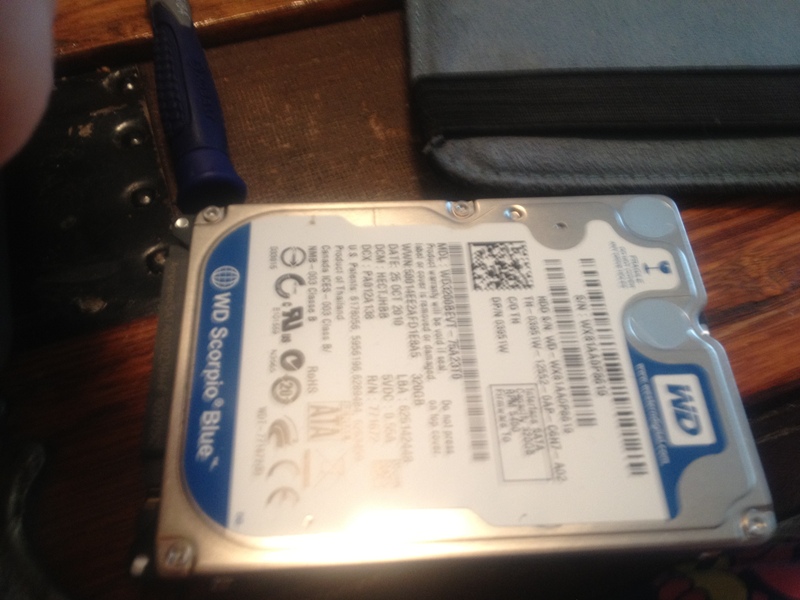 Everyone else: operation hard drive retrieval commencing. Once upon a Lollipop Tuesday past, I needed to install Internet at my apartment but didn’t want to pay the $100+ for someone else to do it. I was concerned that I would fail mostly because my brain isn’t really wired for things mathematical and logical. My brain is wired for finger paint and mocking people in my head and neuroses of all shapes and kinds. But I sucked it up, read the manual, and after sporting a very furrowed brow for a very long time, was happy to report success, a functioning Internet, and a lot of money saved. I would have happily just taken my computer to the Geek Squad or a local computer guru to have them take care of things for me. I was prepared to sell my body if necessary to get my old files out of the death trap Inspiron. But I was quoted a flat fee of $100 to just bring it in and apparently, I wasn’t prepared to do that. I’m protective of my George Washingtons and I was determined to not pay someone solely because they are smarter than me. So my brother sent me the manual for my computer which I brought up on Dave’s iPad, and I dove in. iPad right, Inspiron from hell left, signature Mr. Bubble pajama pants center. The manual said something or other about “What You Will Need”, and I noted a small Phillips Head and Flat Head screwdriver were in the mix. But I really only had an eyeglass repair kit with a tiny little Flat Head screwdriver and figured it would have to just be my MVP. After nearly stripping the second screw to little bits and bending the “Flat Head” eyeglass screwdriver into “Corkscrew Head” I was unconvinced, and a trip to Lowe’s was in order. I hate Lowe’s. There is nothing there that excites me. It’s all work and fixtures and tools and saws. It smells like lawn chemicals and all I can think of when I enter is the hours and hours I would try to entertain myself in the lighting aisle while my father tried to find something or other to fix a leak or a squeak or a rattle in the house. Apparently my unwillingness to pay someone for being smarter than me is genetic. But to Lowe’s I went. 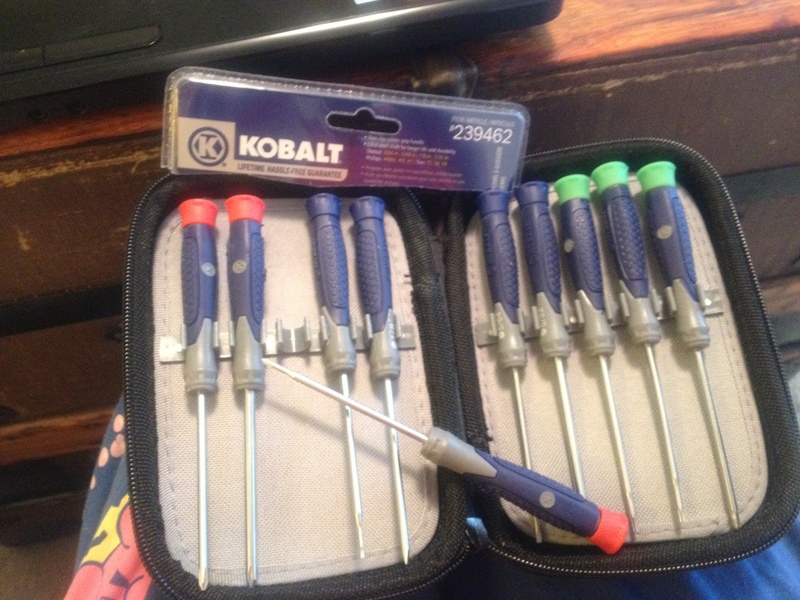 I spent much longer than I wanted in the tools aisle and found a beautiful tiny screwdriver set that could conquer any laptop fears I had. For twelve dollars, I was back in business. As it turns out, dismantling a laptop is a lot easier than I thought it would be. Basically, there’s a big panel hiding under the keyboard that has everything (including the keyboard) plugged into it. That board is secured to the bottom of the laptop with a ton of screws. Unscrew the pieces, dismantle the pieces one by one until you get to the hard drive, and boom: done. It sounds easy in theory but by the time I got to the whole “remove the speaker cable” portion of the manual I got really confused. The picture didn’t look like mine and it wasn’t obvious how to locate the cable on my own. So I began to hunt for a YouTube video to help me through. It was then that the heavens opened and blessed me with a video that showed me that everything I had done up until that point was silly. My step-by-step digging down to the hard drive of my computer was one way to do it, but the better way was to just take out every single screw from the bottom of the laptop, flip her over, and pull up on the palm rest. 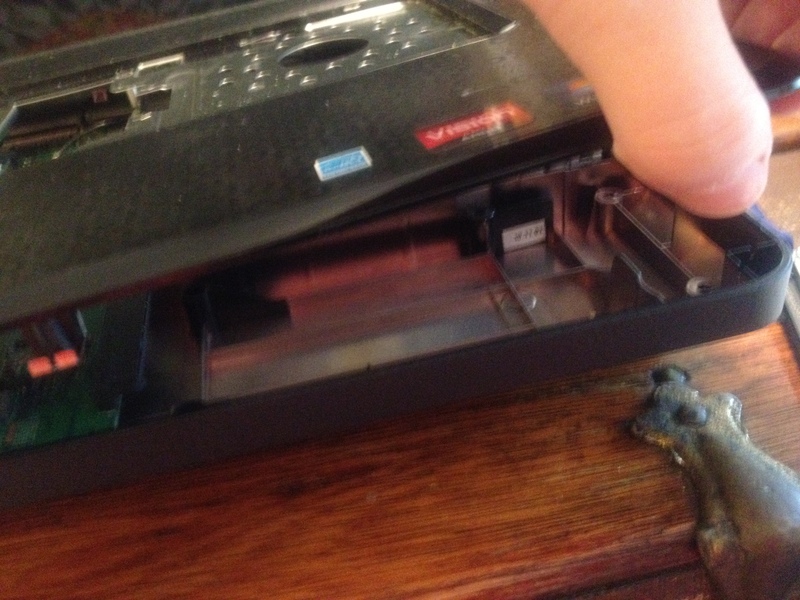 In the model of laptop I had, the hard drive was hiding right at the edge of the panel and I could wriggle my sausage fingers inside to retrieve it. (The video is here if you were reading this hoping for a tutorial). That big empty spot is where I yoinked the hard drive from. It looks kind of scandalous just peeking in like that. And boom: hard drive procured. I sent a pic of it to my brother, who told me what apparatus I needed to pull the files and for $30 dollars at Best Buy, I was so close to sweet restoration. While I was there, basking in the fact that I had saved $50 or more doing the task on my own, I had to invest in a new laptop. Appartently the old one was at risk of having a few more parts hit the pooper on me soon and I didn’t want to risk all this work only to find that a few weeks later, it was all for naught. So I found something reliable and affordable to upload my files to. I was a little worried at first because I was alone in Best Buy and when employees spot a chick in the laptop aisle, they swarm. Not because I’m attractive; because they think I’m stupid. when I asked the Sales Manager where I could find a SATA to USB converter cable, she said she didn’t know what I was talking about. I felt like a computer god. After running back and forth between two aisles of laptops and taking pictures of their tags to compare specs and send to my brother for his approval, I had aquired a sales member named Emmanuel. He was not, however, there to save me. He was there to talk down to me and try to talk me into a $1000 computer. I explained to him that I didn’t need his help and that I knew what I wanted. He proceeded to quiz me on what makes a battery lose its charge, what the difference between an AMD and an i3 processor was, and a myriad of other things I had already boned up on via my brother before I entered the store. Apparently he saw my display of knowledge as a challenge and continued to harass me until he could find something I didn’t know. Finally, I explained that I know what I’m doing, that I “do my own repairs” and that I had a hard drive with me at that very moment that I had retrieved in the AM. 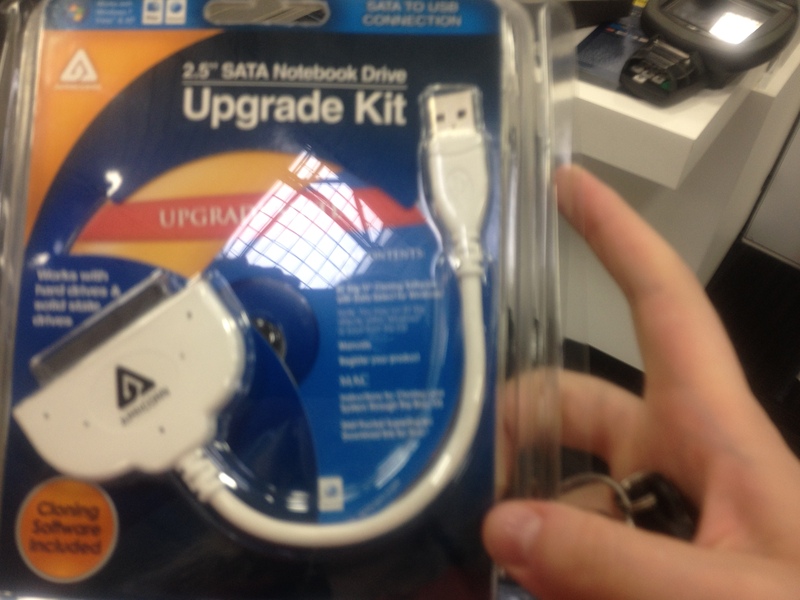 As it turns out, Best Buy associates treat you completely different when you tell them you have a hard drive in your pocket. Emmanual retired to the center kiosk, I found the Sales Manager to let her know I’d like a laptop locked in the bin, and for Emmanuel to stop harassing poor, lonely women in their 20s who are hunting a decent computer. I went home triumphant. 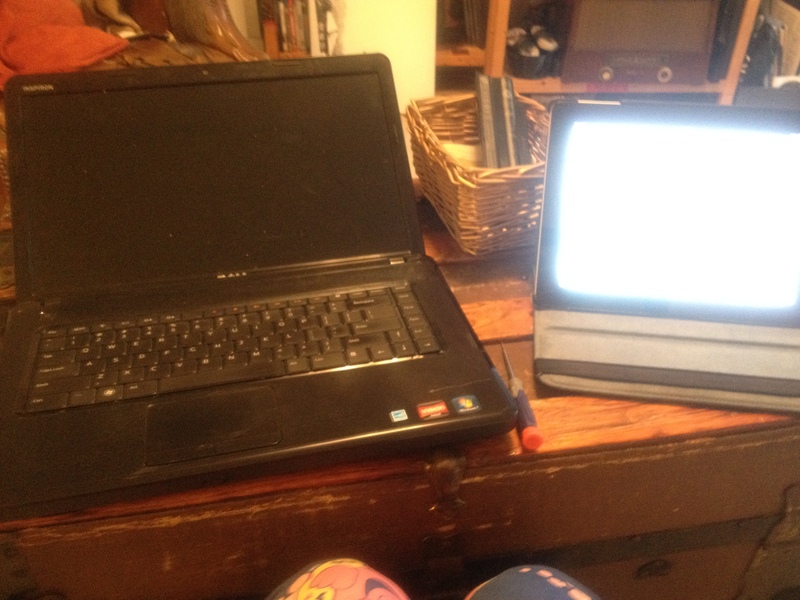 All things worked as promised and I’m now up and running on my brand new laptop with all my old files, and a dismantled old laptop in my bedroom just begging to be sold for parts to make up the cost of the one I’m typing on. And I feel like a king among men. My finger paint brain figured out something technical and computer-y and didn’t melt into a big pile of goo. That’s success if I’ve ever heard it. So hey: thanks folks, for reading this long and rather boring account, for offering condolences last week as I mourned the loss of everything digital, and for your offers to come into the World of Warcraft and pull me out should I seek refuge there. In case that ever becomes a real fear again, I’m a night elf hunter and I’ll be found on Shattered Hand. Does your local Best Buy hit you with a wall of B.O. upon entering? Ours does. It’s disgusting. I’ll take lawn chemical Lowe’s over the scent of unwashed bodies. YES! You know I live for your approval. And no to the B.O. But it’s a big store and the AC is on overtime. Perhaps the scent dissipates. Pinned you. Proud of you. Love you. Jealous of your sense of humor and writing talend. Return the favor and like or comment on something of mine, Easiets the pin. Here it is. http://pinterest.com/pin/147141112796487822/ Staying strong and see you are. Yes, I have to back up. Thanks for the reminder! And welcome back! oh yeah. I should really do that. DARNIT WHAT IS WRONG FOR ME. Thanks for reminding me of my reminder. Ugh, that really borders on harassment. It’s like just because I’m a WOMAN doesn’t mean I don’t know what I’m doing, LEAVE ME ALONE (personal experience? no, not at all). Good luck on getting all the parts to sell…I’m sure that you will be able to. I am thinking I might be embarking on something like this soon, except just taking the cover off the back of my laptop so i can blow dust out of it with an endust can, but there are no screws to be seen! it makes me nervous and want to find the comfort of a manual. 🙂 Glad you’re back! Right? I hate going into a male-dominated interest store. Or getting my car fixed. I have to do twice as much research to make sure I don’t get badgered and/or don’t get ripped off. I should dress like a dude like Laura did when she was buying a car in Family Matters. I think I can do anything with youtube. Anything! Presidency is next. 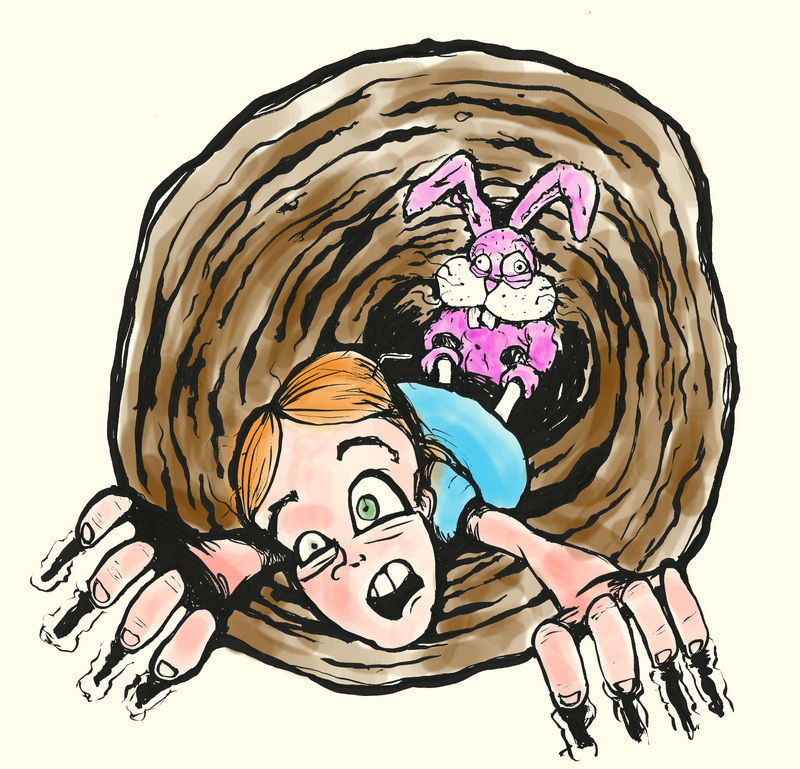 (Yea- I am a stranger,) I just started following your blog and love your adventure and narration. While I congratulate you on fixing your Dell, I was also wondering if you considered backing up your files on a Pen drive or External Hard Disk or even online (cloud services) like dropbox and Skydrive. Explore them if you havent done so already.. and you will love them. Well hello stranger! Most folks here are strangers until they comment. Commenters aren’t strangers; you’ve just been promoted. Thanks for the suggestion about my files – my brother gave me the full rundown of the many different venues I could have more intelligently chosen to house my files.